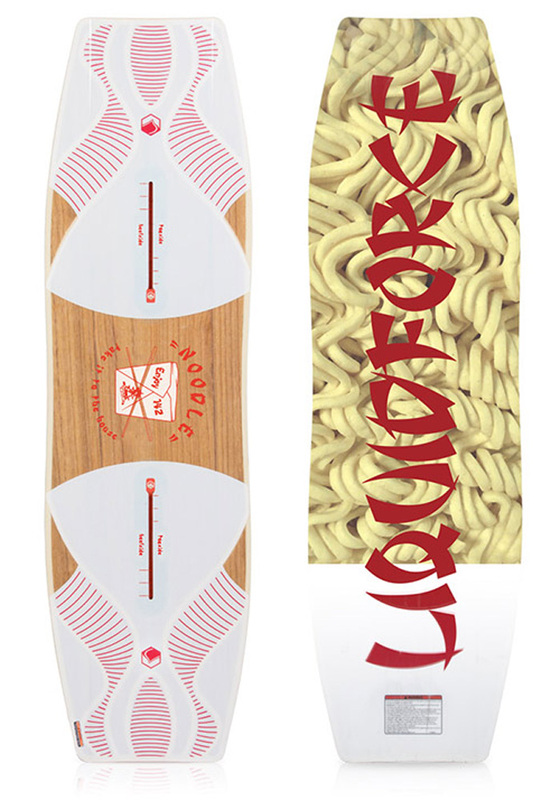 The Liquid Force Noodle is a very different wakeboard being a asymmetric wakeboard with asymmetric sidecut. This gives you a defined toe and heel sidecut allowing you to drive and initiate turns from your feet rather than a rail which is further from your center of gravity which creates a a shorter, quicker turning radius similar to a snowboard. as Liquid Force say ''A WAKEBOARD HAS NEVER FELT AS SIMILAR TO A SNOWBOARD AS THE NOODLE. PRESSES ON RAILS AND SLASHES ON THE WATER HAVE NEVER BEEN SO EASY AND FUN!'' The noodle is a cable park board and with the name comes a noodle-esque flex of soft and progressive 3 stage rocker. Add in a bevelled liquid rail sidewall for less hang ups and allowing flex in the sidewall to prevent blowouts and you know this will shred all you pot in front of it. Highly recommended and tons of fun.